After what seemed like an eternity the first E Street DVD landed on the doorstep today and after a super quick skim here is a guide to what you will find on E Street - The Best of Mr Bad. 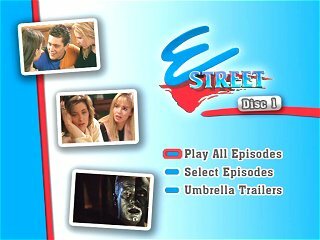 The best thing about this DVD, and it's something you don't realise until you've watched a few episodes, is that unlike some other soap DVD's this release doesn't contain sporadic episodes. This DVD allows you to watch the whole story unfold in chronological order just as it did on TV. So not only can you follow the story of Mr Bad, but you can watch Lisa, Toni, Wheels, Bob and co as they work their way through life on E Street. The DVD comes in a neat little package. Unlike the shabby cardboard DVD's this one has a nice plastic case which protects the cover and holds all the DVD's safely in place. The front cover shows the young Steven holding a lifeless Becky Campbell, and the back has a brief synopsis as well as five stills and a cast list. Open the cover and you'll find episode synopsis for each episode displayed upon a picture of Sheridan and Steven. These are handy when you're ripping through the episodes for the first time trying to find those special moments. 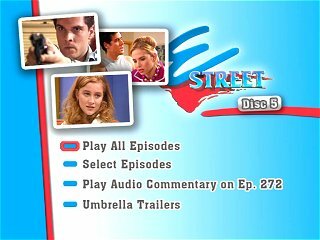 There are five discs in all each containing four episodes, except the last one which holds the DVD commentary as well. Each disc has a picture embedded on it from the programme. They are great little pictures and give a sense of the whole show as appose to just the Mr Bad story. That said the first disc contains a picture of a terrified Virginia staring at the key Steven is holding in his hand. It's perfect and raises the excitement levels just a bit. 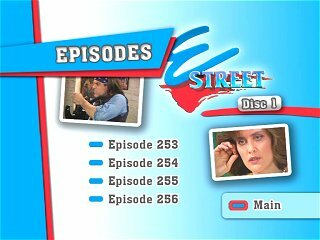 The DVD menus are snazzy and follow the E Street colour scheme. They also hold a few stills and trailers for other DVDs produced by Umbrella. See our pictures below for more on what they look like. 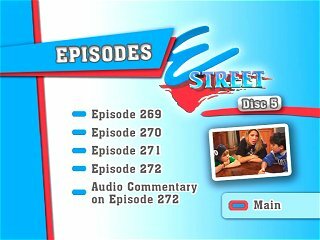 The DVD kicks off with episode 253, a better choice would have perhaps have been the previous episode which features Elly's return and Sheridan's first encounter with Steven. But alas this is still at the very start of the storyline and way back in the days when Steven was a much-respected individual and Sheridan was still viewed as the ice queen. The credits appear in full and of course you get to hear the theme tune without annoying continuity voice overs, this is especially great in episode 264 when the credits roll to Jo-Jo singing. It's a great song and nice to hear the full, uninterrupted version. The E Street logo also appears in the corner several times during the show, which signifies the advert break. UK viewers may be unfamiliar with this procedure as the logos stopped appearing on Sky One's version around the time of episode 150. Episode 254 marks Virginia’s death and the scene is shown in full, unlike the slight cut which was made to the Sky One version. Terrifically haunting and a moment that you'll no doubt rewind a few times once you get over the shock! Episode 260 also seems slightly different to the Sky One edit and Steven's attack on Michael seems even more brutal than ever before. The only other edits UK viewers might notice are longer location shots establishing the scenes and sometimes the music in the pub differs to some of the tunes that were heard in the UK. But the incidental music remains the same and the advert breaks seem quite close to how they were broadcast in the UK. The highlight for me was the fabulous commentary on episode 272. This was done by Andrew Mercado who has been behind so many of these great soap DVD releases, and Bruce Samazan (Max) and Melissa Tkautz (Nikki). To hear them speak of E Street for around 40 minutes is an absolute thrill and Bruce and Melissa share plenty of stories, memories and giggles as they watch themselves and their co-stars on screen for the first time in several years. It's a lovely listen and gives a reminder of how popular E Street was and how it became a trendsetter not just for tv, but for fashion and music too. It's a joy to hear Bruce and Melissa discuss their auditions, their first days filming, their popularity and their thoughts on their fellow cast members. They share lovely stories about Cecily Polson, Les Dayman and Kate Raison and Melissa even reveals that she had a crush on Tony Martin! It's wonderful and I could listen to this sort of thing all day. Andrew Mercado also reveals that if this DVD sells well then more will follow and the next release will probably revolve around Sonny Bennett's reign of terror. But as I said before this story isn't just about Mr Bad. We also get to follow Alice as she goes through the final stages of her pregnancy; we get to see Bob rebuild his relationship with the recast Elly. Plus Toni and CJ toy with the idea of romance, Jo-Jo returns, Max and Nikki have big decisions to make and Lisa deals with the loss of Michael and Wheel's involvement with Sheridan. In places the picture quality isn't the best, but it's always watchable and only suffers some flickering in places. Overall the quality is fine and near perfect. There are a few bad edits towards the end of episodes when there is a gap between the picture freezing and the credits rolling but again this doesn't affect the actual viewing of the episode. It just leaves you wondering what's going to happen next! As far as we know the second volume will pick up where this one finishes and will be released next year. It will also include a commentary with Forrest Redlich who will no doubt share some amazing stories with us. In a nutshell this is a fabulous moment for E Street fans. 20 fabulous episodes, two of it's brightest stars coming together for a spellbinding commentary and the promise of more DVDs if this one sells well. If you haven't already then go out and buy this DVD and if you have then whilst you'll waiting for the next volume go to our forum and dicuss these episodes with like minded fans.